Friday was mostly a slow, restful day; on purpose, as my weekend is packed… I spent the morning packing for my weekend trip to Engstingen & then Ottersweier. I’m taking one small bag for the road trip, & trying to squish as much into it as possible. Oh I wished I had the Bean’s mad packing skills with me at that moment. I headed for the Frankfurt main station about 4. Fortunately, I made the 1st train, but somehow, someway that train was slow getting to the next station – meaning, I missed connection to Reutlingen by 10 minutes. There was another train headed that way that was delayed by 10 minutes from leaving – & I jumped on that one seconds before it started pulling away from the station. Arrived about 20 minutes late – picked up by Juergen, the pastor. He took me to house where I would be staying, which turned out to be in the home of an English teacher, Frank & a doctor, Kerstin, (1 e, 1 i.) I had a great room, & immediately connected with Frank on an American history research project was working on – absolutely fun! Frank took me to the church to meet with several leaders – it was not really a ‘meeting’ but rather a ‘meet & greet’ over good pizza (yes, pizza!) & good wine. We had long discussions about how I got connected with Germany, then spent some time getting to know each other. Around 10 p.m. left with Frank to head for bed, & crashed hard. I woke up early to the smell of coffee & biscuits – got to sit & talk with Frank about life & marriage – truly, cultures may be different, but the challenges facing husbands & wives are the same worldwide – great opportunity to encourage each other – too soon, we had to leave to go to the church for Foursquare Friends Day. The Day was hosted by the “Shelter Alb – Foursquare Church” of Engstingen, pastored by Juegen & Gudrun Zeeh – the purpose of the Day was to give their church a perspective on the Foursquare Family, see that they’re a part of something bigger than themselves. Second, talked about the Spirit-filled Life – from John 16:5-8 & Acts 1:8. Talked about how God fills us with His Spirit so we can live for Him, & be His witnesses – that He doesn’t ask us to do anything that He doesn’t provide the ways & means to do it. I tried to make it as interactive as possible & get feedback. I was really encouraged to hear that there was lots of connection with what was talked about, as well as affirmation that this hit where they lived – & better, went along with what they (& Juergen) had been talking about for the last several months. Had to leave to catch the afternoon train to Baden-Baden. On the way, Juergen’s car suddenly stopped – he tried restarting it to no avail. So, in desperation, (I had to get to the train station,) we decided to ‘jump it’ by popping the clutch in 2nd gear, which meant I would push the car, & he would steer it, then pop it at the appropriate time. After 3 tries, the car sputtered started, & we were on the road again. Several people got a good laugh watching me doing my best Jamaican bobsled pushed impersonation. However, I made my train with minutes to spare, & made the rest of my connections with plenty of time. Julia picked me up at the train station with her friend Hannah – took me to her house where I’d be staying with her & her family for the next couple of days. I’ve been really looking forward to this time with Julia & her family – there really is a special connection since she lived with us for 6 months. It was such a fun time with her family. 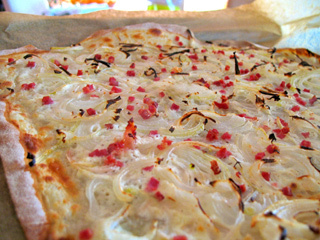 We ate Pflammkuchen (french style pizza. Yes. Pizza) with all sorts of toppings on it, & great wine from the region & vineyards around her home. Lots of laughter & fun, really feels like a home away from home. Talked with Julia a bit about Sunday a.m. She will be doing her first bit of translation – working to help her ease into it. Teaching from John 13:34,35 on Living a Simple Life: Love God, love people. Missing home, theBean, & the family. To minimize the missing, I headed for bed, & crashed hard. Booyah! This entry was posted in Church, Life and tagged Deutschland, Friends, Monday morning church, pizza, Relationships, simple life, spirit-filled life by scoeyd. Bookmark the permalink. …so you steamrolled right past Mannheim on your way south?